A Concord resident is looking for help to find the person who totaled her vehicle during a hit & run crash on Denkinger Rd. on the night of Thursday March 14. The suspect was in a newer model Scion xB – green/silver in color. The neighbor of the victim stopped the suspect and gave him paper to write down his information, however, the driver pretended to provide the details and then put a blank piece of paper under the victim’s wiper, according to the victim. The neighbor says the last four numbers of the suspect’s license plate are 4954. Anyone with information should contact the Concord Police Dept. Have PD check camera at Clayton Rd. and Denkinger around 3:45-4 pm Tuesday-Thursday. I commute home with a man driving a similar car that drives like an 8 year old on the bumper cars. I don’t understand why some people always blame liberals for something like this. Liberal does not mean letting people not taking responsibility for their actions. Your comment is non sequitor. I agree with you, LostBoysMom. There is no reason for anon blame liberals for this. But I disagree with your second sentence. Liberalism used to represent looking out for the little guy. In many cases, it has morphed into letting people shirk the responsibilities for their actions. But then again, this reply (and yours, and anon’s initial comment about liberal America) really belong more on the “talk about politics” thread. I agree with LostBoysMom. Professor, it does not make sense for her to post her reaction on another site, out of context. Is there no way for the police/DMV to reverse lookup for car make/models and the last digits of the plate? There can’t be many matches, if there is even more than the one. If those last four digits actually are correct, then there can mathematically be up to 124k vehicles in the 7-digit numbering scheme. Except there are probably more numbering rules than I’m taking into account. Either way, you’re right in that they should be able to pull DMV records for potential matches to investigate. Actually, forget what I said almost entirely. Unless it’s a custom plate, no CA plates have four digits in a row. Actually most older commercial plates have 1 number, 1 letter and then 5 numbers. Newer commercial plates have 5 numbers, 1 letter and 1 number. And all commercial vehicles have 4 or more numbers in a row. Good luck with that! CPD did not arrest OR ticket the hit and run driver who TOTALED an acquaintance’s vehicle not far from his (the perp’s) own home in the Solano Way area. Maybe it was because this wreckless driver wears (or wore) a MUNI security officer’s uniform and badge. That sure doesn’t sound wreckless. Something is not right about this story. The photo shows a very old car, and it has damage to both the front, rear ends, and sides, including windows knocked out. The front end damage is of a read ender accident. Where is the driver this vehicle rear ended? And a ‘neighbor’ was conveniently nearby following the alleged ‘victim’? This looks like a junk yard car. Have to call bull on the story, unless other proof comes up. From the photo/condition of the car and iffy story, I would be my $1 the car was totaled before it was ‘damaged’ in this ‘accident’. Yes Mary, it COULD have been totaled before but some SALVAGED vehicles are still drivable. A lot of us cannot run out and buy a new car because the one we have looks like crap. The story does not say this suspect damaged the front end. The windows broke out when it got hit. You can see how the rear passenger tire must have been pushed up onto the sidewalk so it got hit pretty hard. It doesn’t matter WHERE the driver is, the car was parked; it was a hit and run and she was apparently.not present. “And a ‘neighbor’ was conveniently nearby following the alleged ‘victim’?” RE-READ PLEASE: “The neighbor of the victim stopped the suspect and gave him paper…..”. Where does it say the neighbor was “following” the victim? Maybe the neighbor was already outside, maybe the neighbor hear the crash and came running out. WOULDN’T YOU TRY TO OBTAIN SOME INFORMATION TO HELP THE VICTIM OF A HIT AND RUN???? I hear what you are saying. We were in the area Sunday and saw the car. Didn’t notice the front end was damaged too. But we did notice it did look like a old junk car, with dust, dirt and worn paint. Jolly rotten of them if it is a hoax though. I thought the same thing, but I wasn’t there. Can the front end be damaged if it’s hit hard enough? I’ll give the victim the benefit of the doubt. I’m not paying for it. The totaled car in the pic was hit so hard that it was slammed into a parked car in front of it. Both cars were then pushed about 4-6 feet. 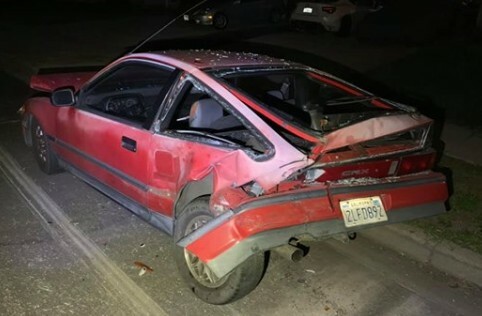 So yes, the CRX is a piece of crap, but it was it good shape before being hit. I also don’t see any tire slide marks or wreckage debris around this vehicle in the street. George, look to the left of the car in the picture. There are skid marks. I passed by the owners of this car around 9 AM the next morning when they were sweeping up all the shattered glass that had gotten all over the street. Pretty nice of them to do. AnonZ, the car was hit so hard it was pushed into another car parked in front of it, which ended up in front of their driveway. All y’all with your conspiracy theories when somebody is just trying to find the person who hit their car and ran. Hope you get the help you need if something like this ever happens to you. What would CPD do without all of Claycords suggestions. They can probably let their whole detective department go. Actually most older commercial plates have 1 number, 1 letter and then 5 numbers. Car already looks like a POS anyway!!! $100 says it ran flawlessly up until its last day. Bet when they find the car it has a 6” diameter tailpipe. How did a newer model Scion xB drive way from that? That Scion should’ve fared worse than the CRX. This almost seems like a stock photo. My insurance company was able to do it in 5 minutes with a partial plate, color of the vehicle & make. 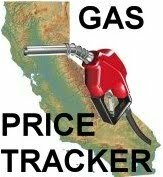 CHP did the same. The problem will be when the person that hits you claims the car is stolen. I am in that area every day almost; will keep my eye out for the car also. I hate people who do that. The system may find many matches but i’m sure only one of them has front end damage. What time of night did this happen? It looks like the person put it in reverse a few times and kept hitting it. And then hit it with a crow bar a few times. I drove by this car just yesterday and the entire car is trashed. There is no way a single hit and run did that. I was actually wondering what it was doing on the street. I drive that way every day to and from work and have never seen this vehicle on the road. I would have too, because it looked like a train either landed on it or hit it and there is no way you wouldnt see that driving every day. Also – the other car would have sustained a considerable amount of damage. It will be interesting to see if this story unfolds somehow although I doubt we will hear about any of it. My guess about the suspect’s plates are either the neighbor got the numbers wrong or it’s out of state. I can’t imagine a vanity plate with numbers like this. I would also check the local body shops and hospitals. The perp must have been flying! Past contestant of a Demolition Derby? Something doesn’t add up …. if I saw a new model Scion violently slam into my neighbors car and smash it to pieces I certainly wouldn’t hand the guy a piece of paper to write a note and walk away …. I’d be calling CPD asap. How was the driver able to cause this much damage and yet drive away in his own car? Way too many holes in this story …. they don’t dare give description of the suspect…..it would be considered racist. There’s a video on Facebook by the way from the victim’s neighbors who had nest cams but it doesn’t show the plate clearly. You see the CRX fly when it’s hit and end up hitting the FR-S in front of it. Neighbor though stupidly should have gotten the full plate & you see the guy in the video act like he put the details on the paper then tuck in under the wiper. The paper when found was blank though and u see the neighbor come back out and try to get the plate details which he should have done before.